Havering Primary Teaching School Alliance: Vision to Provision Returns!! We are delighted to be able to deliver the Vision to Provision programme again this year, funded through Havering Primary Teaching School Alliance. This programme is free to all EYFS leads across Havering. 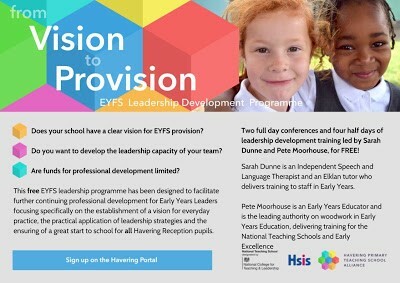 The programme is designed to facilitate continuing professional development for Early Years Leaders, focusing specifically on the establishment of a vision for everyday practice, the practical application of leadership strategies and the ensuring of a great start to school for all Havering Reception aged pupils. This year's programme has been planned around feedback given from participants who attended the programme last year. Please ensure that you book onto all the sessions and make sure that you bring your Headteacher to the conference days. Sign up on the Havering Portal!